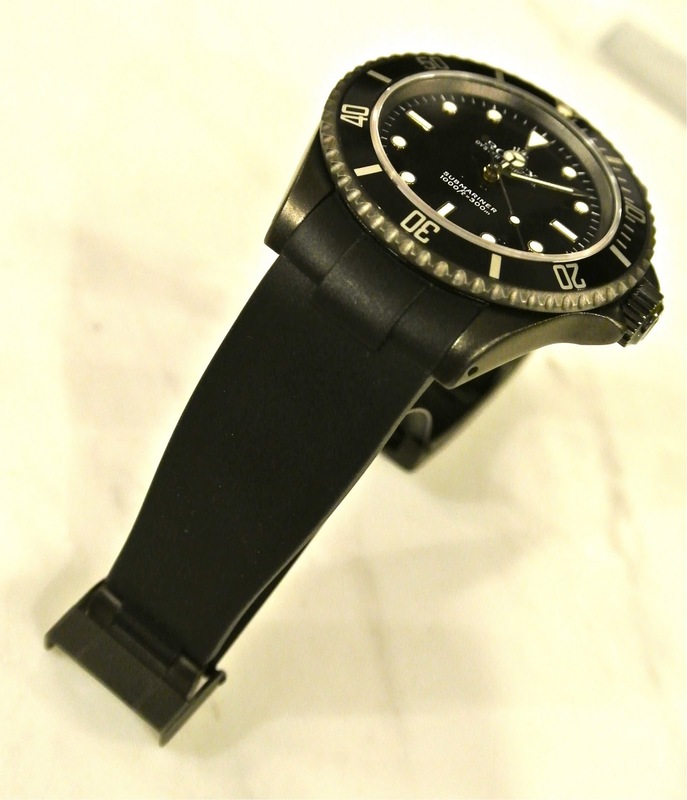 Firstly, the tapering is similar to the original rolex bracelet. The fixed parts of the bracelet, from what I was told. The bottom piece comes with a black (DLC?) link. The straps are contoured to fit the case perfectly. No unsightly protrusions or overhang. It protrudes slightly over lugs but I reckon that's acceptable. The straps cap over the bottom of the case rather neatly as well. The cap extensions of the built-in adaptors look thick but they are actually about the same height of the case back and flush with the top of the case back. The straps are designed for you to use the original Rolex clasp and bracelet links should the straps be too short. On the wrist, the Everest straps are very supple. Not soft but supple - firm but not overly so, but not too hard either. They are just a little firmer than Isofranes but are rather comfortable on the wrist. Although there appears to be a rather huge gap in the pic, the watch seem to be sitting firmly in position. I've had it on for several hours and I did not feel warm at all. You might have noticed some lint on the strap but they are not as scary as some of the lint magnets I have tried. In a nutshell, this pair of straps are generally comfortable, and allows the original links to be added on as well as the original clasp to be fitted on as well. What I really like is the feel and comfort. And the relatively low lint magnetism. But nothing's perfect, these straps come in one size only. So, if you have a small wrist, one solution is to remove the links that come with the straps. Another problem, is the limited colour options. If I recall correctly, they come in only blue, black, green, hunter green and orange (for specific Rolex models). Well, at least they offer more options than Henry Ford! At SGD190.00 a pair, I reckon these are pretty decently priced. And now, the bad news. When the wife saw the watch and the strap, her pupils dilated and stressed that she wants one! Anders, I hate to tell you this but you ain't getting the watch back! - Supple feel, not too hard or soft, just right. - Not a major lint magnet. - Built-in adaptor and contours to the case perfectly. - Can be fitted with original Rolex clasp and links.